CONCEPTION BAY SOUTH, NL – A new brewery with a strong focus on “North American ingredients brewed in a British style” is opening this weekend in Conception Bay South, Newfoundland. Ninepenny Brewing has been founded by Keith and Glenn Bartlett, Dwayne Moores and Justin Mayo, a quartet with plenty of homebrewing experience as well as varied backgrounds in civil engineering, mechanical engineering, and food processing between them. Named after a 19th century term for beer, as well as referring to the nine communities that were amalgamated to create Conception Bay South, Ninepenny will be opening tomorrow (Saturday February 23rd) at 2:00 PM with three beers – Porter, English-Style Pale Ale, and Belgian-Inspired White IPA – on tap and available by the glass and in growlers. 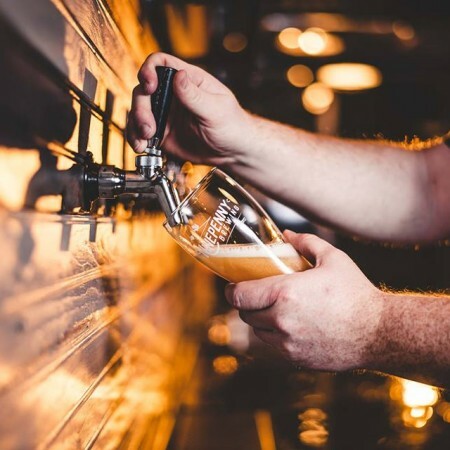 Several guest taps will be pouring beers from other Newfoundland breweries, and more Ninepenny beers will join the line-up soon. Ninepenny Brewing is located at 75 Conception Bay Highway, and will initially be open on Thursdays and Fridays from 4:00 to 10:00 PM, Saturdays from 2:00 to 10:00 PM, and Sundays from 12:00 noon to 6:00 PM. For more details, see the Ninepenny Facebook page.